Our friend Heather is known for making an amazing dip that we all demand she brings to various occasions. She passed the easy easy recipe on to me and I changed it one tiny bit and now I'm addicted... it sounds gross when you hear the ingredients but believe me, it is amazing. 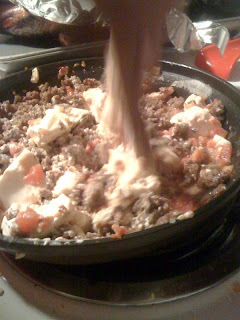 Brown the sausage, add the rotel and cream cheese to the skillet, let it melt and stir, then serve with fritos. (I forgot to get a "done" picture of the dip because we all devoured it too quickly).